Last week we gave you 10 good reasons not to miss the Melbourne Guitar Show, August 6 & 7 at the Caulfield Racecourse, presented by Triple M and Australian Musician. Here’s 10 more! Bring the kids. Not only can you marvel at the amazing range of gear on display but the kids too will be inspired by the performances, entry-level gear on offer and the informative workshops. Take them for a Professor Guitar or Professor Bass lesson. The ukulele session on Sunday morning will have you and the kids playing a uke in just 20 minutes. Buy a family (4 people) weekend pass now online for just $45. Buy them a guitar show t-shirt, get them some autographs and make it a weekend they’ll never forget. 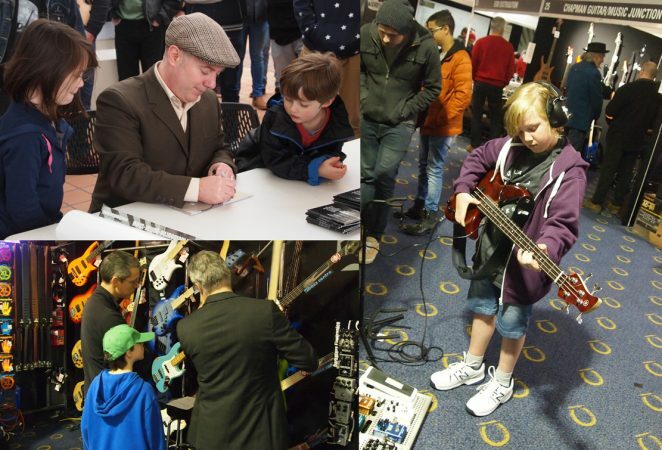 Begin their life-long musical journey at the Melbourne Guitar Show. With such a powerful lineup of electric guitar acts downstairs at this year’s Melbourne Guitar Show, take the time to give your ears a rest and head upstairs to the two dedicated Acoustic guitar stages. On the AON Mezzanine Stage and Exclusively Acoustic Stage, you’ll discover a wide range of acoustic guitar styles. From the delicate touch of internationally renowned performer Daniel Champagne, to Sergio Ercole’s European flavoured classical stylings and Lucas Michailidis’ fingerstyle magic. You can catch them all together along with Jon Delaney and Matthew Fagan in Nick Charles’ second Guitar Players Session for the weekend. If that’s not enough, there’s also Justin Bernasconi playing tunes from his wonderful new album Winterpick, as well as Jamie Pye’s alternate picking skills and the fierce licks and gut-wrenching vocals of gentle giant Mike Elrington. It’s one thing to walk around the aisles and marvel at the tons of guitar-related gear but you might want to know about it in a little more detail. Upstairs in the Winners Circle Workshop Room, you can experience a wide range of informative sessions from guitar experts. There’s Roland/Boss showcasing all of their latest multi-effects systems and WAZA craft pedals, the folks from Peavey running a history of rock n roll through Peavey products, Sherlock Amps demonstrating new amp and pedal product, and Jimi Hocking showing off the new Yamaha Revstar guitars and Vox amp gear. The Maton Custom Shop seminar is back with master luthier Andy Allen, Wireless Audio Pty Ltd extolling the virtues of their state of the art wireless products and Jon Beckx, product specialist for Line 6 with an in depth look at how iconic guitarists like Stevie Ray Vaughan, Hendrix, Eddie Van Halen, James Hetfield and John Petrucci created their signature sound. Dean Ray personifies the romance of rock ‘n’ roll. On stage, he’s all about passion. Losing himself in the moment, his one and only goal is to put on a great rock ‘n’ roll show. Conjuring the spirit of rock icons from the past, the perception might be style but the substance lies in his fretboard prowess and ownership of the stage, where he leaves nothing behind. If you haven’t seen Dean Ray perform before, come on down to the Melbourne Guitar Show, you’re in for a treat. Saturday August 6th 2pm AON Forecourt Stage. The Australian Institute of Music (AIM) – Australia’s #1 Music School – will be opening its doors in Sydney and Melbourne to the general public. Here is your chance to experience the vibrant campus come to life with FREE workshops, masterclasses and live performances from special industry guests. Panels will run throughout the day giving parents and potential students the chance to ask any question about any area of the industry including business, management and performance. SYDNEY – Saturday 6th August. SYDNEY – 1-55 Foveaux St, Surry Hills. 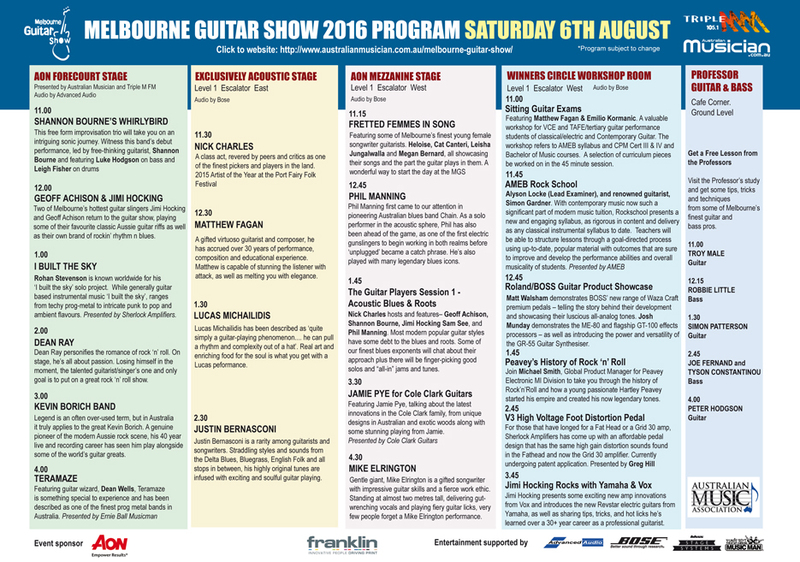 And … if you’re in Melbourne August 6 &7, come down to the AIM stand at the Melbourne Guitar Show, Caulfield Racecourse. AIM will feature some acoustic performances by our guitar and songwriting students, guest visits by AIM guitar teacher Simon Patterson and staff on hand to answer any questions about the course. There will also be a short promotional video of previous masterclass guests at AIM including Tommy Emmanuel, Jon Gomm and Sting’s guitarist, Dominic Miller. 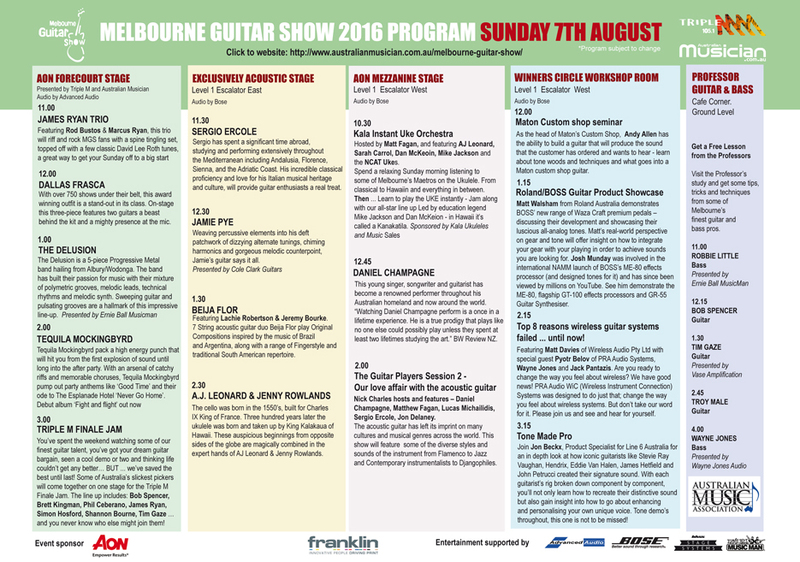 The 2016 Melbourne Guitar Show program is now online. Download a pdf, see what’s on and where, print it out and plan your weekend. Dozens of performers on 4 stages of fretted instrument fun. This year, we’ve separated the acoustic and electric instruments. The ground floor will be full of electric guitars, amps, pedals and accessories. Upstairs you can catch all of the acoustic guitar related product, as well as all of the acoustic-based performances. What are you waiting for? Download the pdf here now! 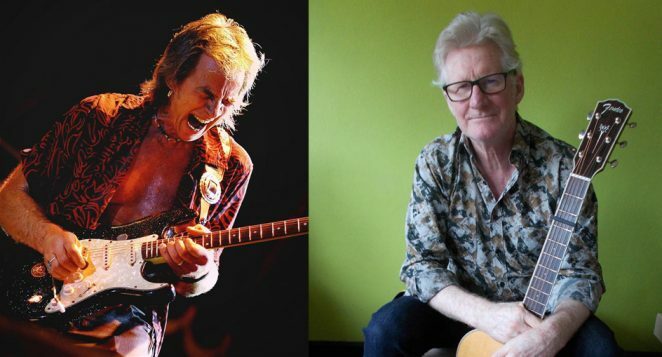 We’re honoured this year to present two of Australia’s most respected guitar players and living legends, Kevin Borich and Phil Manning. Kevin Borich was a founding member and of The La De Das, the leader of Kevin Borich Express, and a member of The Party Boys, as well as a session musician for numerous acts. 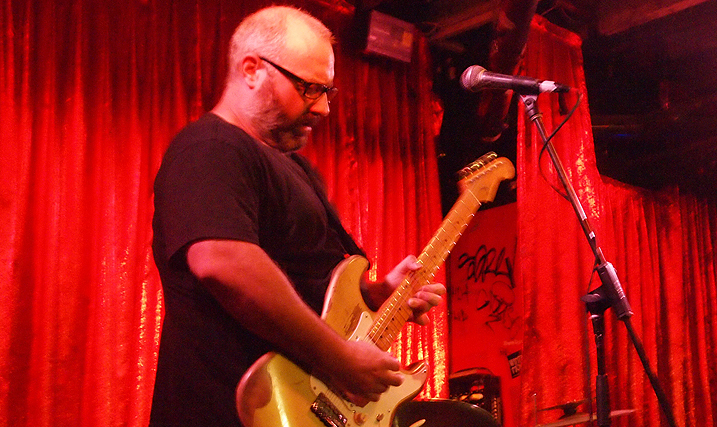 Australian rock music historian, Ian McFarlane has described Borich as “one of the most celebrated guitar players in the history of Australian rock. He also remains an underrated songwriter, as proved on his current album ‘Totem’. Phil Manning first came to our attention in pioneering Australian blues band Chain. As a solo performer in the acoustic sphere, Phil has also been ahead of the game, as one of the first electric gunslingers to begin working in both realms before ‘unplugged’ became a catch phrase. As well as headlining his own shows, he has toured with a remarkable number of artists including Muddy Waters, Sonny Terry and Brownie McGee, Albert Collins, Freddie King and dozens of others, both in the blues and rock genre. Phil appears on the AON Mezzanine Stage on Saturday August 6th on the acoustic floor at 12.45pm. He’ll then immediately join the Nick Charles hosted acoustic session at 1.15pm, featuring Geoff Achison, Shannon Bourne, Jimi Hocking, and Sam See. With decades experience touring the world and more than a dozen albums of critically acclaimed acoustic roots music, Nick Charles is known internationally as “Australia’s virtuoso of acoustic roots and blues”. 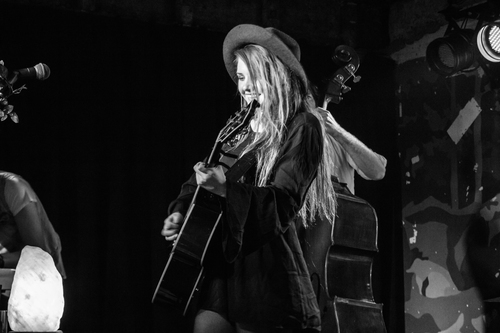 It’s fitting that Nick Charles hosts our special acoustic blues and roots session, which will feature Geoff Achison, Shannon Bourne, Jimi Hocking, Sam See, and Phil Manning. Each artist will perform a song or two each and there’ll be plenty of interplay between them all too. A really unique acoustic event, not to be missed. 1.45pm AON Mezzanine Stage. Acoustic Floor. 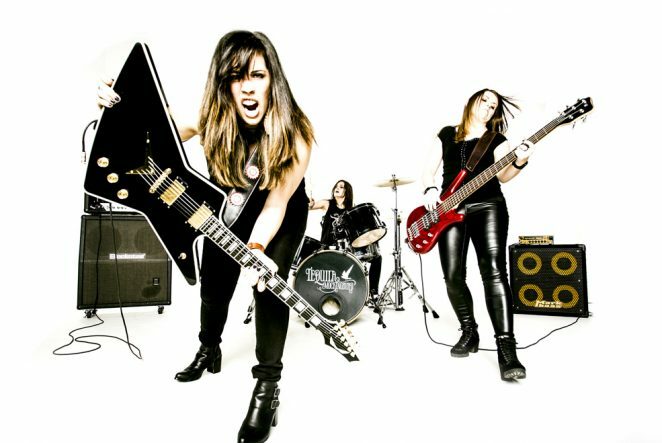 This year’s Melbourne Guitar Show spotlights some of Melbourne’s finest new female singer, songwriter, guitarists. This session includes; Cat Canteri, Heloise, Leisha Jungalwalla, and Megan Bernard, showcasing their songs with guitar and chatting about the creative process. Not one or two but 3 amazing progressive metal bands; Teramaze, I Built The Sky, and The Delusion, will grace the AON Courtyard stage at the Melbourne Guitar Show. They’re slick and melodic, playing complex, driving rhythms, yet will appeal to a broad range of music fans. I Built The Sky 1pm Sat Aug 6 AON Courtyard Stage. Teramaze 4pm Sat Aug 6 AON Courtyard Stage. 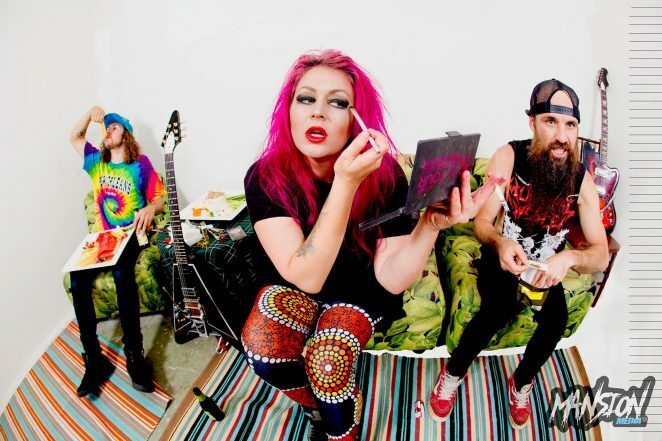 The Delusion 1pm Sun Aug 7 AON Courtyard Stage. If you have plans to buy a new guitar, amp, pedal or guitar related accessory, there’s no better place to do so than the Melbourne Guitar Show. Over 80 exhibitors will be showcasing more brands and models than you’ve ever seen before in one venue in Australia. The best part is that many of the exhibitors will be offering one-off special Melbourne Guitar Show deals. There will be a ton of stock on stands and the exhibitors would rather see it in the hands of happy customers than have to pack it all up and ship it back to the shop again. Check out the exhibitor list on the website, see what brands are where and do some planning. Many of the participating exhibitors will have competitions running over the weekend. Plus from the show organisers, a chance to meet a true international guitar hero. 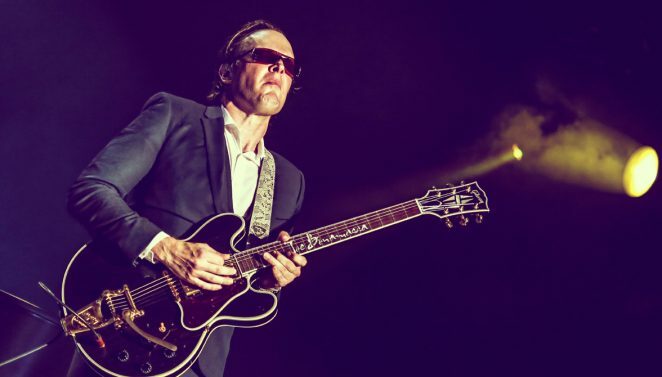 By attending the Melbourne Guitar Show, you can enter the draw to win two tickets to American blues legend Joe Bonamassa’s Melbourne concert on October 5 at the Palais Theatre and also get to meet the great man. One of the most popular features of last year’s guitar show was the Professor Guitar and Professor Bass sessions. On the Ground Level at the Cafe Corner, a rotating roster of some of Australia’s most respected guitarists and bass players will offer FREE lessons. Come on down. Watch and learn and most importantly, it’s a great opportunity to ASK! Professor Guitar sessions include: Simon Patterson, Troy Male, Bob Spencer, Tim Gaze and Peter Hodgson. Professor Bass features: Robbie Little, Joe Fernand, and Wayne Jones. Presented by Matt Fagan, and featuring AJ Leonard, Sarah Carroll, Dan MacKoin, and Mike Jackson. 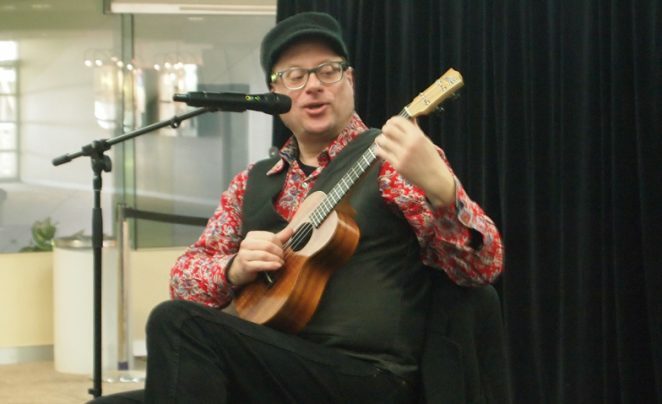 Spend a relaxing Sunday morning (10.30am AON Mezzanine Stage) listening to some of Melbourne’s Maetros on the Ukulele. It’s Sunday afternoon, you’ve spent the weekend watching some of Australia’s finest guitar talent, you’ve picked up your dream guitar bargain, seen a cool demo or two and thinking life couldn’t get any better… BUT … we’ve saved the best until last! Some of Australia’s slickest pickers will come together on one stage for the Triple M Finale Jam. The line up includes: Bob Spencer, Brett Kingman, Phil Ceberano, James Ryan, Simon Hosford, Shannon Bourne, plus Tim Gaze … and you never know who else might join them!